by Jerald Simon on October 25, 2017 in Blog, Motivation in a Minute! Everyone is a unique individual with traits and characteristics all their own. No two people are alike–even twins. I should know because I am a twin. Even though my twin and I both look alike and act alike, we are very different. Everyone is. The same can be said of each piano student and any music student of any age studying any given instrument. Since we are all uniquely original, we should make our musical experience unique to us, our interests, likes, thoughts, views, and feelings. Far too often, music teachers, without even trying or realizing what they are doing, mistakenly try to make their young music students sound alike. They have the best of intentions and want the best for their students, but they are trying to have each student play the same piece of music the same way, either to mimic the composer, arranger, or even how an individual or band performed the piece. Without intentionally creating a conformist cadre of music students who all sound alike, music teachers, myself included, can often direct and sometimes misdirect their music students to playing the music exactly how the music teachers thinks it should sound. Now, don’t get me wrong–the music student should play the correct notes and the correct rhythms and timing as it is written when they first learn a piece. After they have mastered the music, they can change the piece to any style or arrangement of their choosing. However, with that being said, many piano students are taught to sound exactly like each other. Even with playing the same notes and precise rhythm, music students can and should be allowed to have some liberties with how a piece is played dynamically. There are times when I have told various piano students to follow the dynamic markings as a reference and not as written law. Some piano students of mine have heard other students or even myself play a piece a certain way and have tried to play it exactly the way they have heard it. That is fine, but remember, every music student is unique. Why would we want them to all sound alike and strive to be the same? They should stand out from the crowd and be themselves. By putting themselves into the music and allowing their own feelings to direct how the piece is played, they all of sudden come alive and the music becomes so much more meaningful because they are sharing themselves. It is no longer Mozart, Beethoven, or Bach being played the same way it has been played a million times before because the student has breathed new life into the piece. I believe we do a great disservice to our students if we do not encourage them to find their sound. No matter how hard they try, they cannot be us, just as we cannot be them. It is not about teaching them to play the way we do or even to learn to play their instrument the way we learned to play our instruments. Doing so creates a culture of trained monkeys. In this context, I am not referring to teaching music students by rote, where the music teacher plays something and shows the piano student what to play. I am referring to music students relying on the teacher to tell them how to play a piece musically, such as when to get louder or softer and how loud or soft they should play, trying to play exactly like their music teacher does or the recording they’ve listened to a thousand times. By doing this we are sending the message to our students that their ideas, suggestions, input, thoughts, and feelings don’t measure up to what we want out of their performance. We are telling them that the piece is not perfect unless they can play it the way we do or the way another professional musician has before. Unfortunately, I saw this happening in my piano studio with my own piano students, primarily in working with students on their own compositions. Many piano students take lessons from me to learn about composing, arranging, jazz, improv, music theory. They would like to learn how to take that theory they have learned to create music of their own either by composing something or arranging any piece into any style or genre they’d like in any key they want. They would ask for ideas and suggestions and without even thinking, I would automatically sit down and say, “If I were composing something with these chords, scales, etc., I would probably create something like this…”, and then I would compose something on the spot for the student as an example. In my mind I was helping and guiding the piano student and showing them everything they could do to compose something of their own. In reality, I was showing them how to mimic me and compose something I would compose. Soon all of my students were composing music that sounded like something Jerald Simon had written because, essentially, it was. They copied my style, my chord progressions, my dynamics, and did everything I was doing. The only real problem was they were being me instead of themselves. I even had several students who met other students of mine at school, games, or events who happened to be performing their own music. 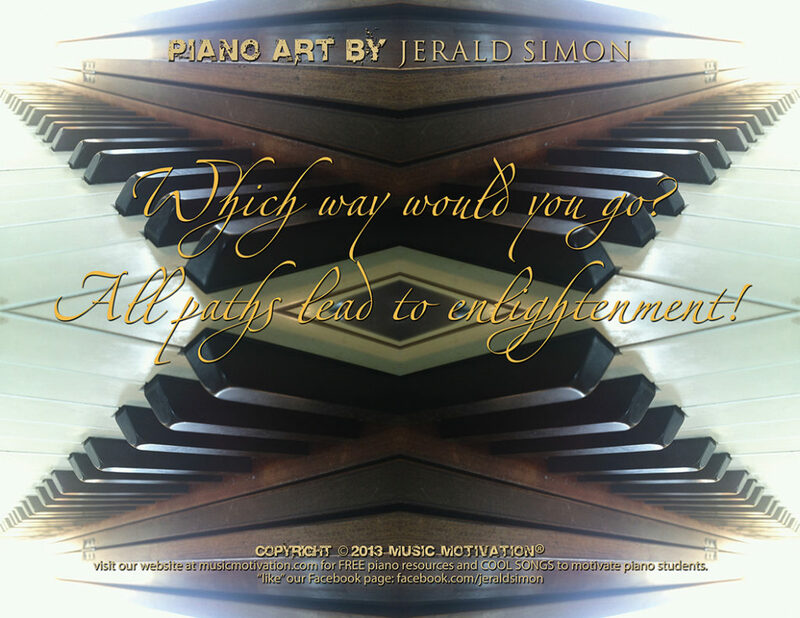 Those listening would comment that their song sounded like something their piano teacher, Jerald Simon would compose. As the conversation progressed, they all discovered they were piano students of mine. I had given ideas, suggestions, comments, and guidance that enabled them to compose music that sounded like something I might compose. Now, I have many different sounds and styles with my own music, but within a given genre or style I definitely have a sound of my own for that given genre. Everyone does. When you listen to or purchase music from bands of today or your favorite artist, they always have their own unique sound. It is theirs. Other musicians, bands, and performers may try to copy that sound or style, but everyone has their own unique style. It is personal and it should be. Everyone should let their own personality shine. Whenever we try to help our students sound like us or to have everything sound exactly the same way, we create a musical mold that mandates that everyone be the same. This constant conformity causes more problems because our musicians are less likely to break out of this mold if not allowed to be free to create their own sense of sound beginning at an early age. Ask the student if they know what kind of a musician they are. You can start by asking if they are a classical musician, or a jazz , blues, pop, rock, country musician, etc. Sometimes helping them think along these lines will help them discover what their sound is within a certain genre. We all know that a musician can cross over into many genres and styles and that many musicians enjoy a mix of everything from classical to rock. But helping students grasp a concept of what their own playing sounds like even when playing someone else’s music is the perfect first step. Completely ignore the dynamic markings in the piece or pieces they are working on. You can even cross out the dynamic markings and ask the student to write in their own dynamics. I know this sounds like you are going against the grain and guess what? You are! You need to if you will help your students discover and develop their own unique musical sound. This is not something you will do all of the time since your music students absolutely need to know how to play the written dynamics as they are. With that being said, however, they must at some point learn to add their own dynamics and determine for themselves what they personally would like to do with the music. Doing this puts them in charge and they take command. They advance from being spectators in the musical field to actually participating in the event of this extraordinary music lifestyle. Ask students to write down random letters from the musical alphabet (A B C D E F or G) in any order and then have them play those notes. Once they have done this, ask the student to change the rhythm of the musical notes and have them create a melody of their own. Then have them take their own melody and try to play it in various key signatures. As the students do this, they automatically begin to think of a melody as a moving part weaving in and out of various key signatures. Have students try to do this moving up in half steps because it is easier to do since they are only moving up or down half a step. It’s like walking up and down a set of stairs one note at a time. With this activity, ask your student if they think their melody sounds better in one particular key signature over another. Take any music the student is currently working on, including their own compositions, and tell them to play the notes as written, but then to try to change the rhythms into a jazz, pop, or rock style. Even if they don’t know how to do this or what those styles even sound like, this is a great exercise to see how they can think and reason for themselves. They are not changing the notes that are being played at all–only the rhythm. This is a great way to focus on how a piece can completely change and sound very different even when you are playing the same notes. If you change the rhythm, the piece will automatically sound different and help the student learn about what it takes to make a piece sound unique. Just don’t do what I used to do and show them how you would play it because then they will want to copy what they have heard you do. Push them and challenge them to try different beats on their own. Ask them to play something in a different way based on what you say. You are not telling them how to play the piece, but you can ask them how Mary Had a Little Lamb would sound if it sounded sad, happy, jazzy, mean, film score-like, pop, rock, modal jazz, blues, psychedelic, etc. The list could go on and on. How would Beethoven play this piece (even if they are playing a Mozart piece)? How would Bon Jovi, Bruno Mars, or even Batman play this piece? What would this piece sound like if Wolverine or the Incredible Hulk played it? What about Wonder Woman? Allow the students to search for their own sound. They use their own ingenuity to discover what a certain song might sound like, and then they can determine how they will produce or reproduce that particular sound on the piano or whatever instrument they are using. It allows the student to express themselves and let their own creativity guide them along. This makes the musical experience so much more meaningful to the student and the teacher. I hope you enjoy these five ideas. They are simple suggestions I have tried to help my own students discover their own sound. Hopefully these ideas can help you discover your own sound and can help you guide your music students as they are discovering where they fit in the musical world. There are so many more ideas and possibilities out there. See what you can come up with. I’d love to hear your thoughts and ideas.